No single factor drives customer loyalty, and not all of the factors that drive loyalty are easy to control — or necessarily controllable at all. Customers don’t pledge their loyalty lightly, and even when they do, they can quickly shift it elsewhere. As a result, businesses often struggle to drive and retain customer loyalty, and no business can ever assume that its customers are loyal. How can a company hope to succeed amidst so much uncertainty? If a business can change the nature of its customer interactions from transaction-centric to relationship-centric, it can convert its customers into brand advocates, giving them a sense of “membership.” Businesses and customers that have this kind of relationship constitute the Membership Economy. 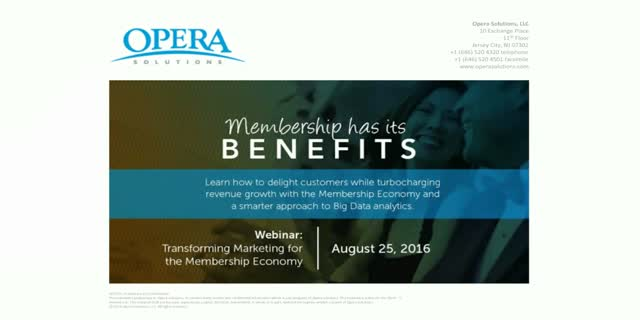 By applying the principles of the Membership Economy to the concept of Aspirational Value, utilizing a customer engagement framework that links Big Data analytics to the customer journey, and enabling processes and technologies that deliver customer-centric marketing as an operational capability, businesses can more effectively drive and sustain customer loyalty. Please join us for a webinar panel discussion with the author who developed the concept “Membership Economy,” Robbie Kellman Baxter, as well as Big Data analytics executive Matt Guenin. They will explore these topics in detail and share their observations about how industry-leading companies are putting these concepts into action. Even the most successful businesses face revenue growth challenges over time. The right answer is probably a combination of both, but in many cases, businesses overlook the advantages of placing proportionately more emphasis on existing customers to drive revenue growth. By focusing on existing customers, seeking to optimize their “Aspirational Value,” and applying Big Data analytics to massive sets of customer data, businesses can successfully reverse declining revenue, drive revenue growth to new levels, and deliver sustainable growth under different market conditions over time. Please join us for an informative webinar to learn more about these concepts and review case studies illustrating how three industry-leading companies used Signal Hub from Opera Solutions to successfully grow more revenue from their existing customers. 1) Why does it often make more sense to focus on driving revenue growth from existing customers than prioritizing new customers? 2) What is “Aspirational Value,” and how can companies apply this concept to support their revenue growth objectives? 3) How can Big Data analytics play a role in accelerating revenue growth from existing customers? 4) What is Signal Hub, and how can it help companies more effectively extract insight from their Big Data, convert it into synthesized intelligence, and apply that intelligence to solve business challenges? 5) How have industry-leading companies successfully generated strong incremental revenue growth by using Signal Hub? Most organizations struggle to extract value from Big Data. Success requires that they change their philosophy about their data assets, simplify the mechanics of generating relevant information from their data, and reduce the friction between generating insight and taking decisive business action. Watch this video to learn why you need to build a Signal Layer for your enterprise. Health Management Associates executives describe how Opera Solutions Hospital Revenue Leakage helped find $20M in missing charges annually. In addition, Revenue Leakage eliminated $4–5M in auditing costs, further improved reporting capabilities that impacted the CFO, and provided root-cause analysis of erroneous billing, which helped identify and correct the problems. Daphne International is one of the fastest growing shoe retailers in the world with 6,500 stores across China. Analyzing and forecasting sales was not easy — especially when dealing with thousands of stores and carrying thousands of models. Opera Solutions applied its products and know-how in Big Data analytics to provide predictive and prescriptive analytics. Now store managers and company executives can access accurate sales forecasts, predict winning models, determine optimal pricing, and better manage inventory. Business impact has been very positive, with a 5–10% margin improvement. Learn how Opera Solutions can help you extract the biggest value out of your data and translate it into real gains. Do you know how much data equity your company has? Airlines benefit from Opera Solutions' products and expertise to leverage Big Data and analytics that transform their businesses. By inserting a Signal Layer, which serves as the foundation for Big Data analytics using the Signal Hub platform, airlines are able to refine their view of the customer portrait and orchestrate operations to serve each customer better and in a more personalized way. The ensuing results are increased revenues, more loyalty, and increased customer satisfaction. Watch Arnab Gupta, Founder & CEO of Opera Solutions, deliver his vision at SXSW Interactive on how analytics empower people and enterprises to maximize their full potential. He provides specific examples on how analytics are expanding human capabilities and allowing us to accomplish more in science and business.